This week we celebrate Valentine’s day. St Valentine was a Priest who, during Roman Times was persecuted for marrying out of favour Christians. This is my view on the best five current romantic trees or shrubs for this celebration of love. A small oriental summer flowering dogwood tree with a distinctive horizontal tiered habit. Ideal for small gardens as a central tree within a lawned area. This is not quite bamboo but a shrub that currently has attractive red fire “passion” coloured leaves and berries. This is an image taken today. This evergreen shrub produces great winter scent right now. The secret is to hide it amongst other trees and shrubs near to a doorway. So, when you walk past the smell is gorgeous. Contact Ace of Spades Gardens Ltd for more information about creating great relationships with your landscape. During the 1980s-1990s the majority of Elms within Holland succumbed to Dutch Elm Disease. This was then followed by the majority of UK Elm trees. Regionally in Holland, they then replanted with mono-cultures of ash trees along highways and within public spaces. 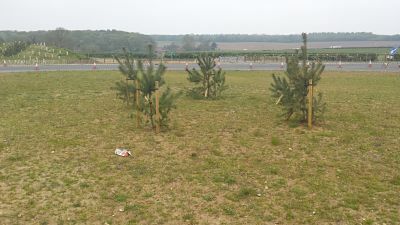 The Dutch it is estimated are currently 6 years ahead of the UK with the ongoing spread of Ash Die Back, and recently a Dutch firm reported their findings and methods of tree management at an Arboriculture Association conference. The management of ash tree risk along roadways and public spaces is now an ongoing intensive, costly process with the continual decline and death of trees taking place. It is now recommended for tree surveys to take place between June to September. With survey parameters similar to the segmenting of the tree canopy as detailed in the London Tree Officers Management Guide to Massaria management. Ash tree infection is due to released spores which can extend over a distance of 30km from the host site. There is a variation in ash tree species susceptibility with 90% mortality of ash tree cultivars such as “Jaspidea and Golden ash.” There is 100% mortality with the Victorian favorite of the weeping ash. Tree defoliation is commonplace with trees under 40 years old being more sensitive. Generally, with Common Ash Fraxinus excelsior 80-90% won’t survive. Any seedlings from these trees are all infected. Secondary basal infection of the trees is commonplace with honey fungus which then causes the total failure of the tree. Trees with more than 50% ash dieback defoliation are recommended for felling when they present a risk to targets. Although regrowth may subsequently take place when trees are healthy and are located within an optimum sites which are generally tidy locations being cleared of leaves and dead branches such as an urban landscape. When surveying the trees, the branch size diameter is a significant risk decision. And the future pruning of the branches shall be carefully made as defoliated branches may still alive even if they have been leaf free for 12 months. We offer a specialist service for the management of these trees within the landscape. Searching for a qualified tree surgeon in Norwich is something homeowners and businesses throughout Norfolk frequently look for when their trees begin to get too much to handle with everyday household tools. While it may appear to be something you can do on your own there are many things to consider when maintaining your trees appearance and health. Trees are a great natural resource that provide shade, privacy and protection but there comes a time when you will want to cut limbs off that have grown out of control. Instead of trying to tackle this job yourself you may want to hire a professional tree surgeon that has the experience to get the job done right the first time. It shouldn't cost a lot of money to get a quality job completed. We have expert tree surgeons in Norwich that specialize in a number of services that can help you with tree surgery. Whether you're looking for tree surgeons, coppicing, pollarding or dismantling of your tree, we can get the job done at a reasonable price. We have years of experience and are a leader in Norfolk tree maintenance. We understand the laws homeowners are faced with in being responsible for maintaining trees in Norfolk and have the knowledge and experience to trim trees properly. If you're in need of a quality tree surgery in Norwich look no further than Ace Of Spades Gardening. Now that you have some basic information on where to find a qualified tree surgeon in Norwich you can rest assured that your tree services will be completed professionally and at a cost that's affordable. Maintaining your trees to comply with local laws is important but it's also the healthy choice too. By hiring a one of our team from Ace Of Spades Gardening you are doing your tree a great service. Regularly cutting limbs and removing dead branches helps your trees to flourish and continue to grow in a healthy way and that's a win win for you.